well, clearly no. but we can always create one. What about Fett's crest with the F and leaf? ok i got the coat done but its kind of crude. i couldnt do flames so its realy basic. how do i put it in a post? I like it, but it looks kinda plain to me.. Just brainstorm for now, people. If we're to have an emblem of our own, it should be symbolic and at least well thought of. What about Bobba's helmet on top, instead of the regular ones presented there? what about Jangos blue helmat on the left and bobas green one on the right and than the slave 1 in the botom half? YEA! its way cooler than the one i made but Ralin Drakus is right about a darker backround. what about a blood red that slowly fades in to a black? Yeah, as I said it's just an idea. I'd have to make the school black if you wanted the background red...but I do like the fade idea. And when I said you should post this at the AMM thread I men like requesting it or something else now that a few people are working on this I don't know if it's necessary. Alo is that photoshopped or is there a custom crest making program that i don't know about? this is me not FMR I was using his laptop and forget he was logged in. i have photoshop CS3 on my computer but i have no idea how to use it so i just used paint. Note:im not computer illiterate its just i have no use for it and never use it. but back on topic... ill try to put the fade in with photoshop tomarrow after i learn how to use it. And we could put the Boba Fett helment on the top and a motto in Mandolorain. So? It would give an affect. 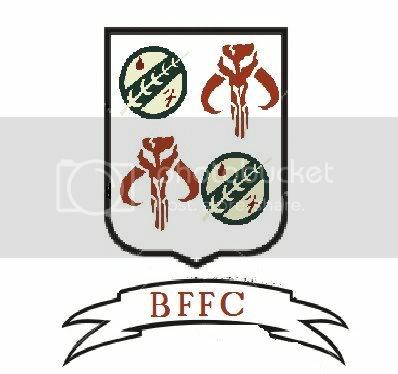 Is it the BFFC coat of arms or the Boba Fett coat of arms? 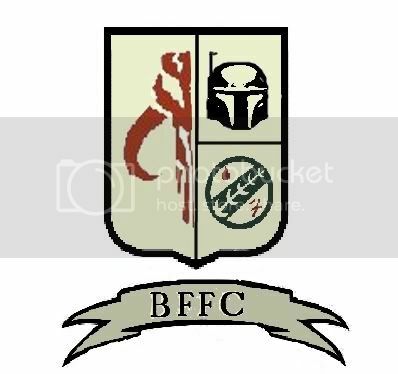 If its for the BFFC then the Mando'a would be super. Perhaps Boba could learn some? I'm sure it would help in regards to being a Mand'alor. i like the mando'a motto because it is very symbolic. its like "e plubius unium" on the doller bill. i still havent learned how to put the fade in with photoshop so any one that could help please do so.